Officials at the Dilmunia Grand Canal and Marina signing ceremony. NSCC International, a reputed Abu Dhabi-based contractor, has secured an early works contract worth $4.5 million from Ithmaar Development Company (IDC) for its landmark project - Dilmunia Grand Canal and Marina. 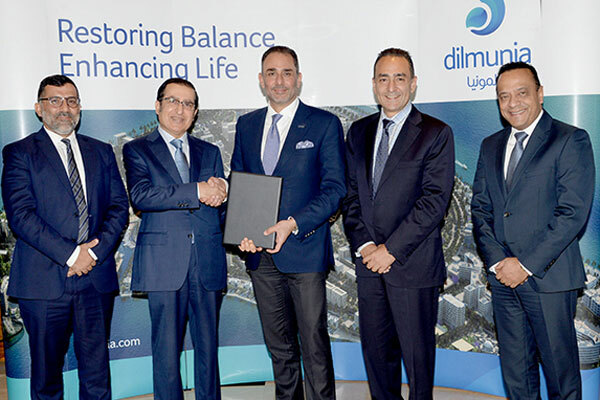 The $1.6-billion Dilmunia Project is a mixed-use development being built on a man-made island off the coast of Muharraq with a unique health and wellness anchor including residences, a hotel and leisure and shopping districts anchored around a health and wellness cluster. The development of the ambitious 125-hectare man-made island is being managed by IDC, which is a wholly-owned subsidiary of Ithmaar Bank, a Bahrain-based Islamic retail bank with its shares traded on both the Bahrain Bourse, Dubai Financial Market and the Kuwait Stock Exchange. Ithmaar Bank is also the Investment Manager of Dilmunia Development Fund. The Dilmunia Grand Canal and Marina is a major element of the development. The Grand Canal will feature public promenades, geysers, water fountains, water walls, cascades, boardwalks and viewing decks, said the statement from IDC. With a total length of 1.7 km, and a width spanning 15 to 35 m throughout the Grand Canal, it will have sea water pumped in around the mid-point of the canal with the water flowing via gravity in two opposing directions of the entire canal, it stated. The Grand Canal will cut through the entire stretch of Dilmunia in a semi-circular route, making it Bahrain’s largest man-made water body and providing breathtaking vistas to surrounding developments within Dilmunia, and one of the kingdom’s longest continuous promenades to residents and visitors of the island, it added. Announcing the awarding of the contract, CEO Mohammed Khalil Alsayed said: "After a robust tendering process, IDC has appointed NSCC International, a reputed Abu Dhabi-based contractor, for the execution of the early works package." An expert in the field of foundation engineering, ground improvement, onshore marine works and horizontal directional drilling, NSCC said its track record in the GCC includes works in Abu Dhabi, Dubai and in Bahrain, where it was engaged for two tower projects in Bahrain Bay. The commencement of the Grand Canal and Marina works has set the tone for the upcoming attraction IDC is set to unveil together with stakeholders of Dilmunia in the upcoming year, which will make Dilmunia the destination of choice for residents and investors in Bahrain, he added. Jean-Claude Bejjani, the project director of Dilmunia, said the awarded works in Dilmunia consist of soil improvement, soil levelling and contiguous pile works. Alsayed said that IDC and the stakeholders in Dilmunia looked forward to a smooth and timely execution of the works so as to enable it to proceed further in the construction of the Grand Canal and Marina. "The properties in Dilmunia now being allowed for purchase by foreign nationals and the increasing number of inhabitants in the island, its attractiveness as a favoured destination has gained further traction," he added. NSCC International CEO Khalil Khouri and stated that they are honoured to have been awarded the package at this critical project stage. He added that NSCC’s experience in executing projects in the GCC and Bahrain is a testament to their experience. Issam Khoury, vice president, overseeing the execution of the early works package, said the NSCC team led by Hazem Nour, the project director, was keen to demonstrate its capability, and having worked closely with IDC’s team in the past few months, was confident of delivering on the targets.